FINANCING SURFACE TRANSPORTATION: Raising the federal gas tax is going to be key. Congressional Problem Solvers Caucus releases report with policy recommendations to rebuild US infrastructure. Allowing expenditure of Harbor Maintenance Tax revenues would increase in investment by 29 percent. The Problem Solvers Caucus in the United States Congress released a new report this week with bipartisan policy recommendations to renew and build US infrastructure. The forty-eight member caucus, led by Representative Tom Reed, a Republican of New York, and Josh Gottheimer, a Democrat from New Jersey, launched an infrastructure working group to find consensus on a bipartisan set of policies for a plan that addresses the need to rebuild and invest in infrastructure across the US. The infrastructure working group, met with over one-hundred outside stakeholder organizations, the administration, and leaders in Congress, to develop concepts to move an infrastructure plan forward. These bipartisan policy options will be the foundation for a comprehensive plan to improve the nation’s highways, roads and bridges, transit and railways, ports and airports, water and sewer systems, energy systems and the power grid, and broadband and communications networks. The key recommendation in the report is for Congress “to provide stable long-term sustainable funding for infrastructure.” That would take several forms, including an increase in the federal gasoline tax, expanding the tax-advantaged infrastructure financing options of municipal and private activity bonds, and incentivizing public-private partnerships and private-sector solutions for infrastructure development. The report shined a spotlight on problems with the Highway Trust Fund, which is supposed to provide federal dollars for building and maintaining surface roadways and which is funded primarily with the federal gasoline tax. Since 2008, however, spending has exceeded declining revenue in the fund, and the 18.4 cents per-gallon gas tax has not been increased since 1993.
the value of imported commercial cargo. This user fee and the trust fund are supposed to pay for harbor maintenance and dredging, but those funds must be released through annual congressional appropriations and Congress often releases less than the amount collected through the harbor maintenance fee. 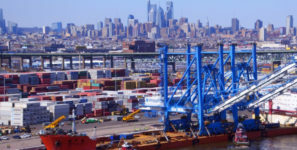 “Allowing the expenditure of Harbor Maintenance Tax revenues would provide more than $18 billion over the next decade, which is a 29 percent increase in investment,” the report noted.